Swimming is a great workout because the whole body moves against the resistance of water. It is an all-round activity because it keeps our heart rate, builds endurance, muscle strength and cardiovascular fitness. The swimming pool at Perungalathur is designed to world-class standard. The students are commuted to the swimming pool as per the time-table. 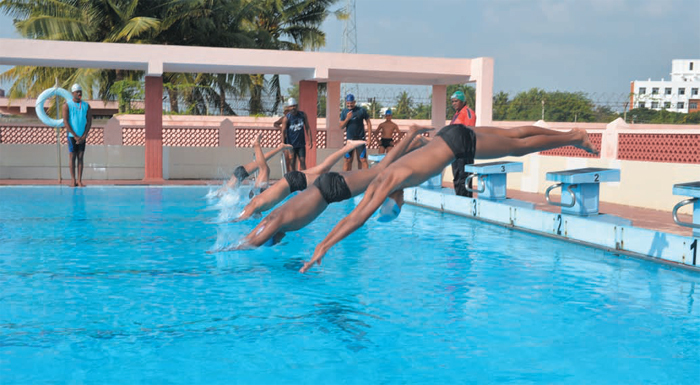 The students of classes III – X are given extensive coaching in swimming as a part of the curriculum. Nutritious snacks are provided after the swimming class. A swimming costume is supplied to the students and subsequent replacements thereon is made on payment. The swimming pools are set up with all safety measures in place, conforming to the standards. They are well-maintained with ultra-modern technology that ensures continuous recycling of the water. The dressing rooms and shower facilities are available. The classes are conducted separately for boys and girls. The students represent the school at various Interschool and National Level Swimming competitions. The students are trained by coaches with life-guards who are alert and vigilant. Some students may be exempted from swimming on medical grounds. These students however, must commute to the swimming pool and watch others perform. Students who fall sick on a particular day will be exempted from swimming, for that day, by the concerned staff. If the student is not fit to attend swimming class on health grounds, exemption will be granted on written request. The school takes utmost care about the safety of the students. However, for any untoward incident beyond control, the school shall not be held responsible.